Red Ride, originally uploaded by [Zakkaliciousness]. Morning commuter commuting in sunshine and style. And a wind chill of -15 C.
Shiny red on the lovely blue bike lanes of Copenhagen. 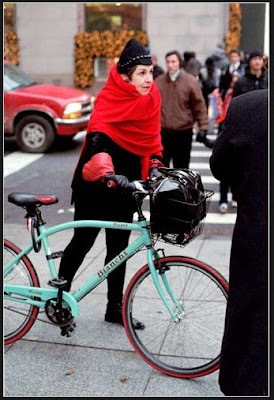 Thanks to a couple of our regular readers for sending us a link to a slideshow at the New York Times with cool photos of chic and funky New Yorkers on bikes, taken by Bill Cunningham. Here's a little teaser. To see the rest, click on to the Times' website. Cool to see fashionable NY folks getting into two-wheeling. Personally I loved pic 4 and 7 best. oh my god--I have the Bianchi Milano too!!!! (girl's frame tho) And in the same colour! I love my bike--it's like an extension of me. I wonder why its only fashionable (uhh... how do i say this properly) more mature women that have discovered that a bicycle is th ultimate fashion accessory? They look fabulous but where are the younger bicycle fashion hounds?